The 16-annulene synthesized by Herges and his team. Click for 3D. If the magnitude of the rotation is > 100°, then the sign of this rotation can be very reliably matched to either enantiomer. This allows the absolute configuration to be assigned with a lot of confidence, and probably much more easily than trying to do it by other methods. The magnitude itself can be reliably predicted to within 10% of the true value if the molecule is conformationally rigid. However, if it has any rotatable groups (and that even includes e.g. OH groups), then the result can be enormously sensitive to that conformation (or Boltzmann mixture of conformations). Put the other way, calculating the optical rotation could be regarded as a very sensitive way of determining conformations! 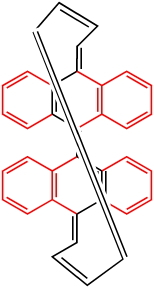 So what of the 16-annulene synthesized by Herges and co-workers. Well at the B3LYP/6-311G(2df,2pd) and SCRF(CPCM,solvent=chloroform) level of theory (which is reasonably accurate, although one can do better of course), the enantiomer shown by clicking on the graphic above is predicted to have a rotation of -1355° (for the digital repository entry for the calculation, see 10042/to-2176). That is indeed a large value for such a relatively small molecule, and is probably more reliable because of the lack of conformational ambiguity. Well, you saw the prediction here! Anyone up for testing it experimentally? This entry was posted on Wednesday, April 22nd, 2009 at 2:57 pm and is filed under Interesting chemistry. You can follow any responses to this entry through the RSS 2.0 feed. You can leave a response, or trackback from your own site.